Lex & Stacey bring 2015 in with a bang when we find out that “Lex the Horrible” hasn’t said all he needs to say as of yet. 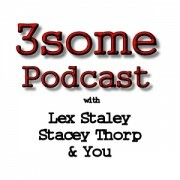 Also we weigh in on Stacey’s dark political thoughts and find out that Lex’s are much darker. Lex & Stacey ask the age-old question: Would you blow a guy to save the lives of your family and loved ones? Also, they discuss the TV show “Justified”, the prospects of Hillary in the White House and past Presidents. In this episode, Lex & Stacey discuss the holidays, TV & radio holiday programming, Bluebloods, Scott Stapp, hunting and securing the border.